This is going to be a long post - it was a 4 day trip and one hell of an experience. I am going to pen down everything that comes to my mind (but trying not to get boring). Also, we didn’t click many photos as we mostly concentrated on creating a vlog. So, photos are not that many, but I have linked to our vlog for each day. 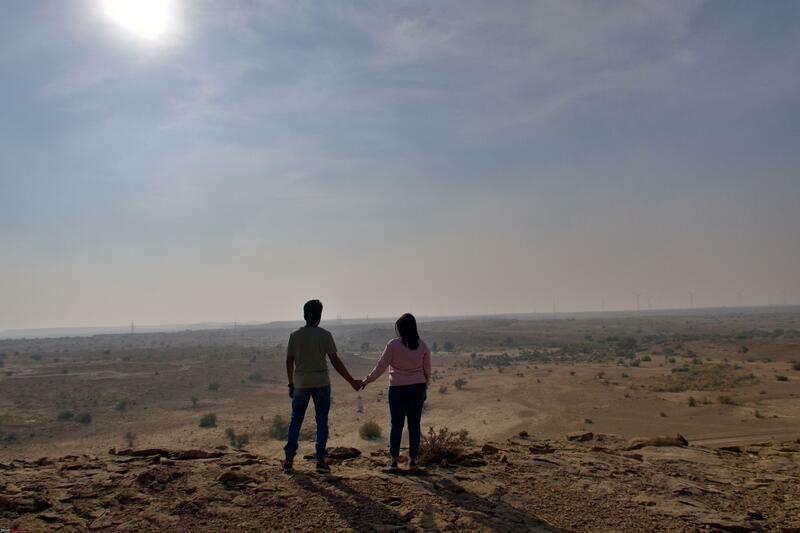 After shifting to Gurgaon 6 months ago, we (me and my wife Shalu) had not been on a trip except for travelling back and forth from Jaipur. My desire for a long road trip was building up. Year-end was approaching and we had a few pending leaves which would lapse if not taken otherwise. Christmas holiday was falling on Tuesday so, we decided to take 4 leaves and have a full week trip. I was excited already. I wanted a long road trip so all nearby options were out of consideration. Shalu was sceptical how many kilometres I could endure in a single journey. 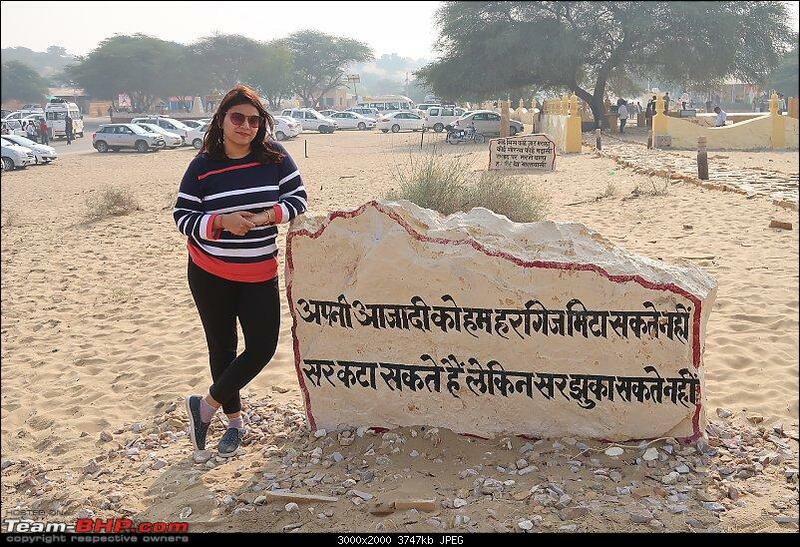 We first considered Gujarat and attend Rann Utsav. Unfortunately, it was running full until the end of January 2019. Secondly, my brother-in-law and sister-in-law, who would also join us on the trip, had already been there. So, that option was dropped. 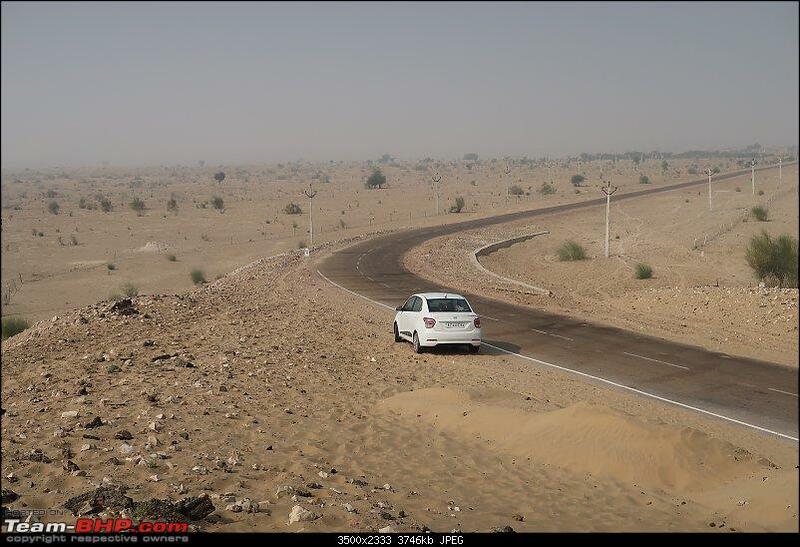 Jaisalmer is about 800 kms from Gurgaon and according to Google Maps it would take around 13 hours. Add some breaks and I estimated it would take around 16 hours. Our itinerary required us to cover those in a single day. And I was the only one who could drive! I was pretty confident I could do it, but everyone else was underestimating me. Shalu was quite worried and looking for options where we could stay overnight if I had any issues driving and needed some rest. My colleagues in office scared the hell out of me and I started doubting myself. Anyway, I kept saying to myself I can do it without any issue. 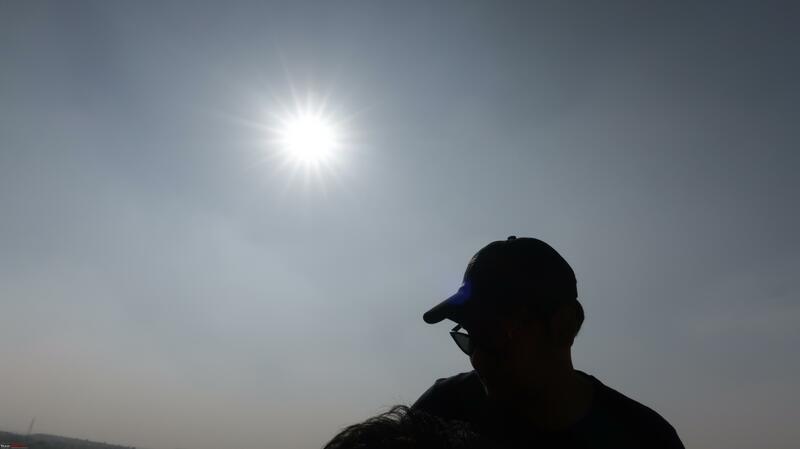 Last edited by shashankjain16 : 13th January 2019 at 11:13. The Judgement Day finally came. I could barely sleep the previous night (don’t know why). Lack of sleep got me worried more. Anyway, we had packed quite a few Redbulls and I would drain them down if I felt sleepy (luckily I didn’t need a single one). We woke up at 6 AM and had planned to leave by 7 AM. We wanted to cover as much distance as possible during day time. Surprisingly, we were able to leave on time (rarely happens with us). 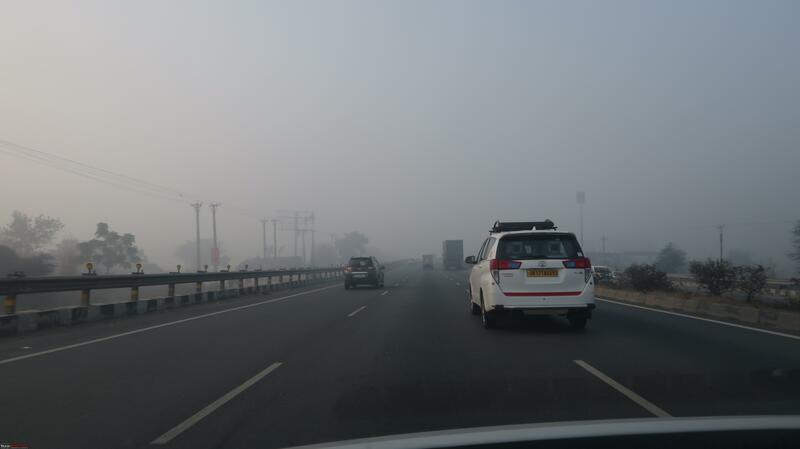 After losing our way in ever changing roads of Gurgaon, and adding good 10-15 kms, we were finally on NH8 and so the journey began. I like to drive within SPEED LIMITS. Even if road is empty, I would not go over 110 km/hr. Besides safety, driving within speed limits is more calm and peaceful for both - you the driver and the fellow passengers who are trusting you to reach the destination safely. 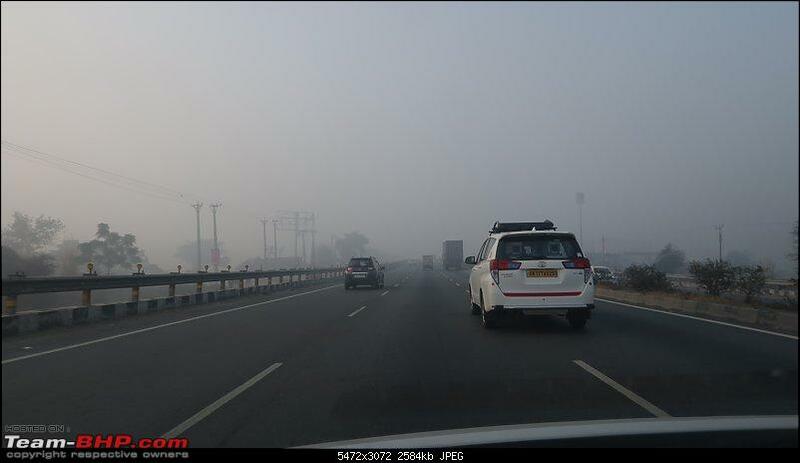 By 12:40 PM we reached Sikar bypass and had covered almost 300 kms. I was happy with the progress. Most importantly, we had not wasted any time on useless breaks. We stopped only for 10 mins to attend nature’s call. We had our lunch at a small highway-side restaurant Hotel Raisalot Palace. Food was good. In half-an-hour, we were ready to hit the road again. The roads!!! 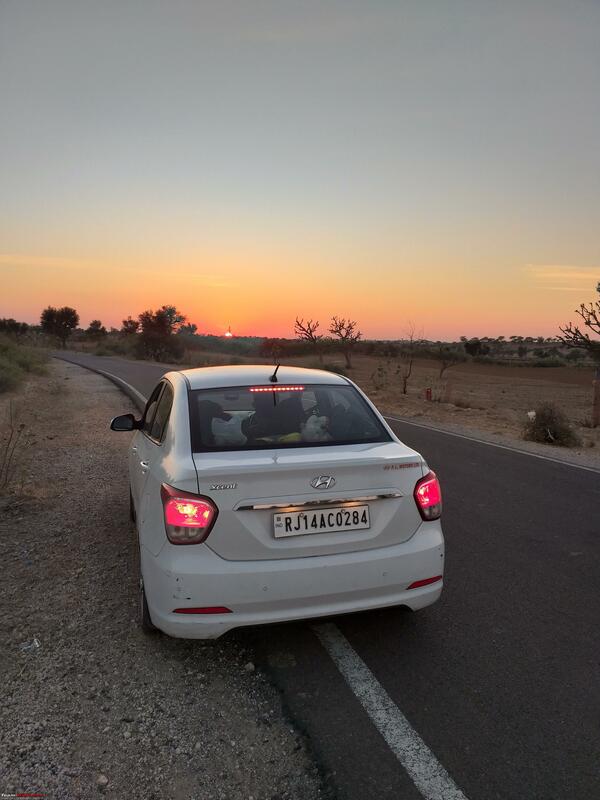 I must say the best part of the journey was the butter smooth roads of Rajasthan and that also without much annoying traffic of trucks and tractors. Add to that changing landscaped and beautiful scenes. I was enjoying it so much that tiredness and sleepiness were nowhere to be seen. In no time (actually 3 hours) we were at Nagaur at around 4 PM. 507 kms done! I was only about 50 short of breaking my record of the longest drive (before this I had been to Kasauli from Jaipur which is about 550 kms). 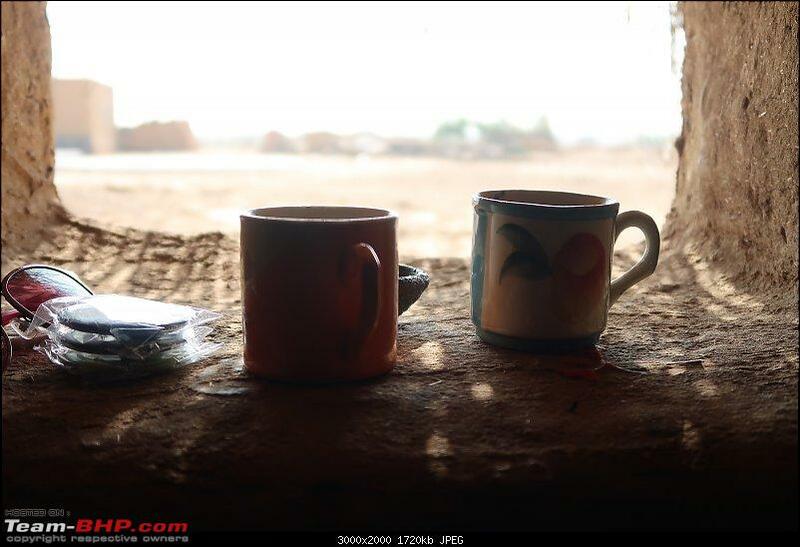 We took a small tea break at Nagaur and hit the road again. Not to mention, had a good tea in really, really long time. Rajasthan serves good tea. The next stretch of road was not that awesome. It wasn’t bad - we could still cruise at 80km/hr on an average. However, roads were not super smooth and at places, construction going on. Still, this was the most awesome stretch of the whole journey for one single reason - the sunset. 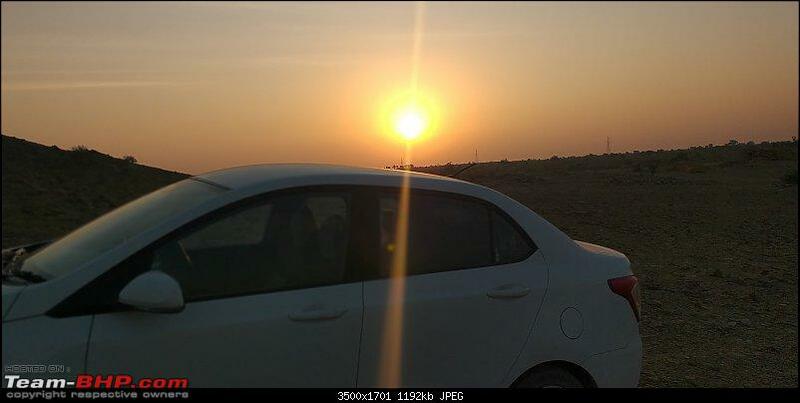 As we were going from east to west, the sun was setting in the direction we were driving and believe me - there cannot be a better setting for a driving enthusiast. 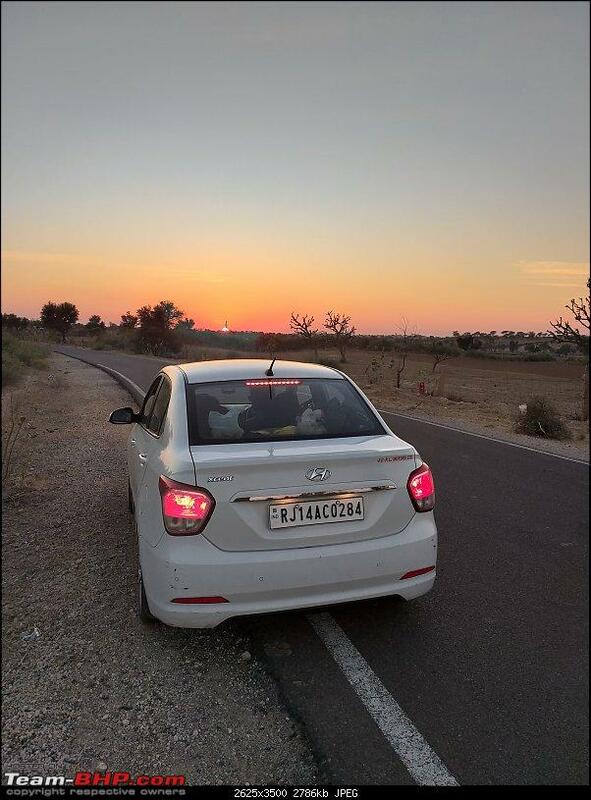 It was so calm and peaceful to watch the sunset while cruising peacefully that when that road ended and when we reached Phalodi, I just didn’t realise. It was about 7:30 and we had completed 680 kms. I am amazed myself, as I write this, that I was able to do this. We stopped at the junction where the road met NH11. We had to attend natures call again but could not find a decent washroom anywhere. So, we were on road again after 10 mins. 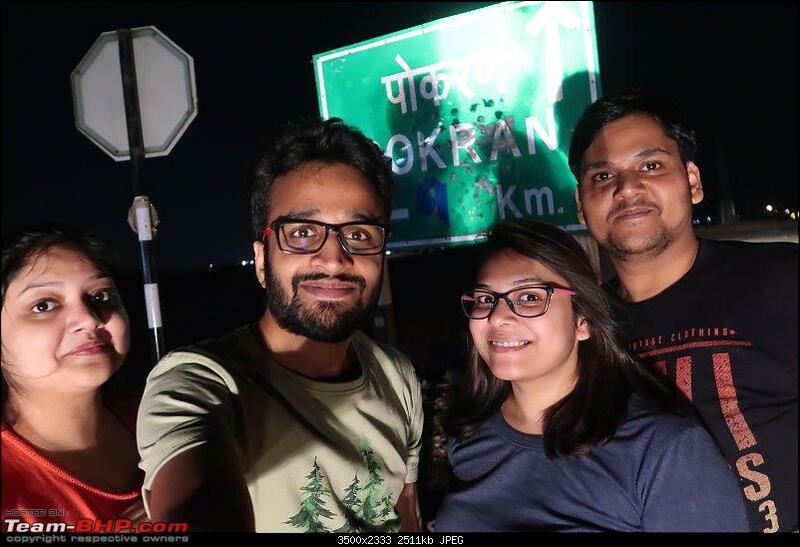 My god - NH11 was the best road of the whole journey. It is a newly constructed highway (some parts still under construction) and our car - Hyundai Xcent - was just gliding over it. I wish my car had cruise control. 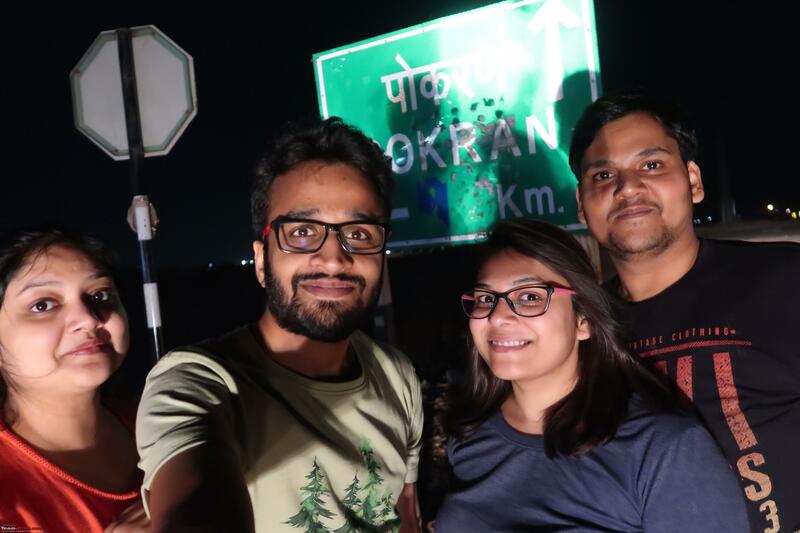 Anyway, after some time we were at Pokhran and stopped there to get some photographs clicked with the Pokhran signboard. It was extremely cold outside and that cold rather acted as a relaxing agent. My fatigue disappeared and I felt fresh as morning to hit the road again. Only about 50-60 kms were left and our destination was near. 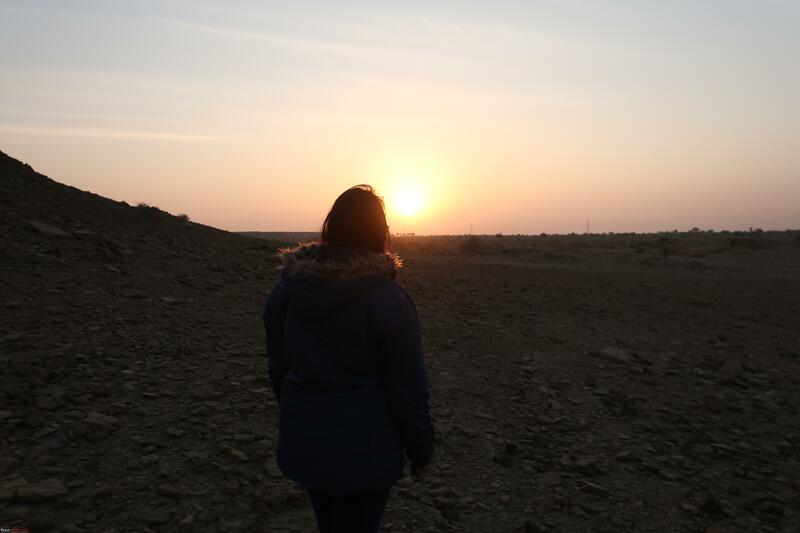 At around 10 PM, we were finally at Jaisalmer. I had done it!!! I was quite tired now but was not as much as I had expected. Got beautiful look of the fort on our way to the hotel. 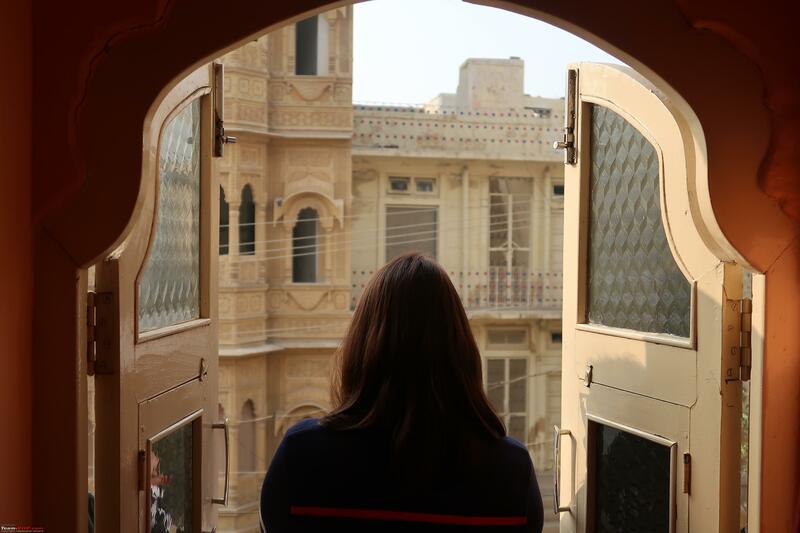 We weren’t that much into luxury, so had booked a decent hotel by the name Hotel Jaisal Palace. It was quite neat and clean - staff was very helpful, and rooms, although small, were quite bright and comfortable. It cost us around Rs 7500 for two nights for two rooms. 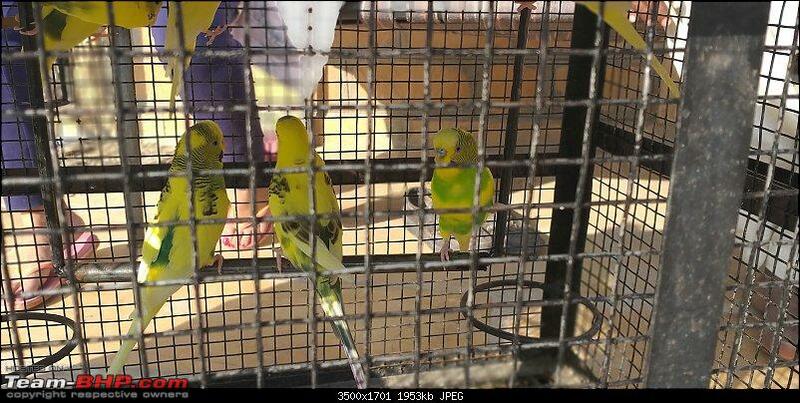 I can say, it was jackpot deal in the peak season of Jaisalmer. We had saved anything between 7000 - 10000 by not opting for a resort. We had our dinner at the Hotel itself and it was good too - almost like home food. We were in our beds by 11 PM. Last edited by shashankjain16 : 13th January 2019 at 19:30. We woke up by 8 AM next morning and got ready by 10 AM. We had breakfast in the nearby market. Of all, the pyaz kachoris were yummy. Indeed, pyaz kachoris of is part of Rajasthan are famous. You can see Jodhpur Kachori Vala in literally every street of Jaipur. We were ready to go by 11 AM. The drive to Longewala was an experience in itself. 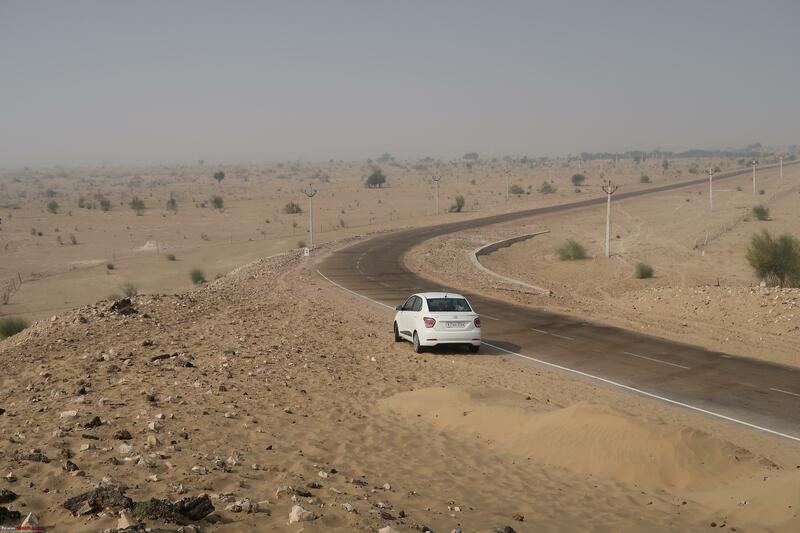 The view of vast barren lands, timid sand dunes here and there, and good roads managed by BRO - it was all mesmerizing. The roller coaster ride of going up the steep inclines on the road and speeding down even steeper ones was so much fun. We were shouting “Whooo” every now and then. We had a short stop in one of the dunes to get our hands dirty with the sand. It was a windy morning and the air was perfectly warm to give a peaceful feeling. 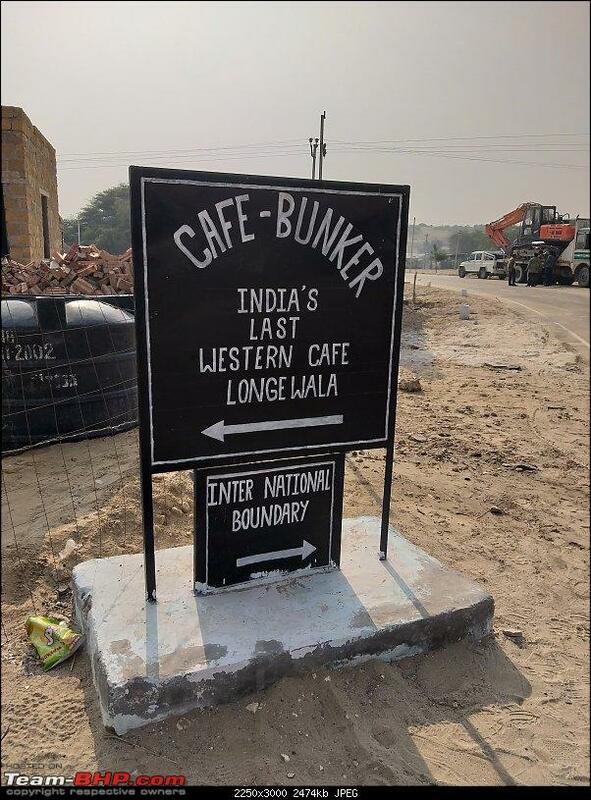 We reached Longewala by 1.15 PM. 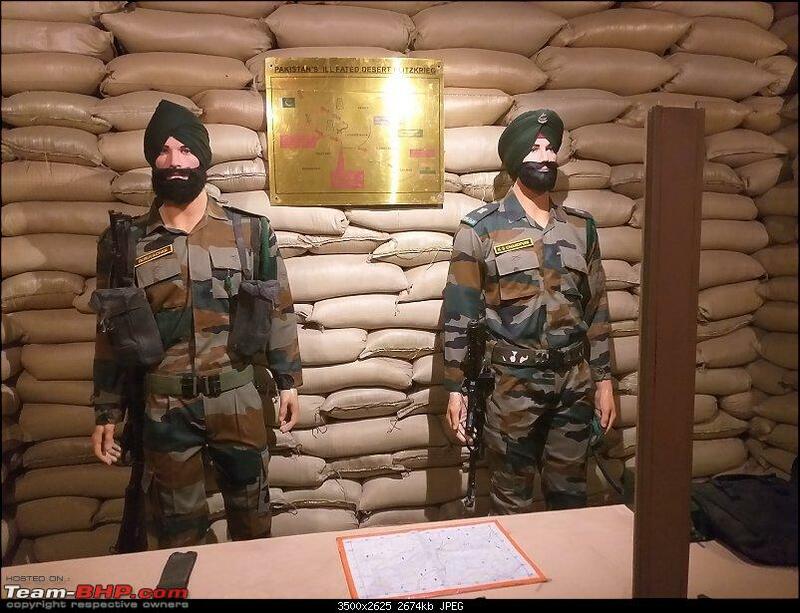 It is a war memorial which has actually captured tanks of Pakistan on display. There are a lot of inspirational quotes written everywhere. They also showed a short documentary on the war as it happened and how bravely our soldiers fought an army 30x bigger than them. We felt so patriotic at that place. 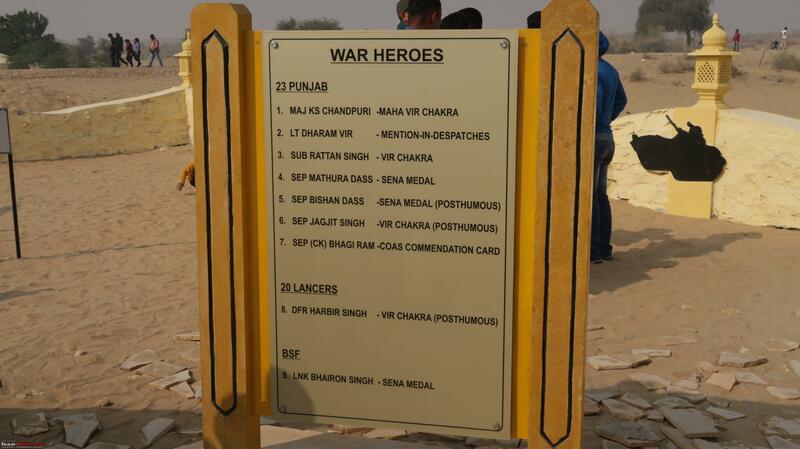 Longewala is indeed a place to visit and to feel the sacrifices our soldiers make to keep us safe. 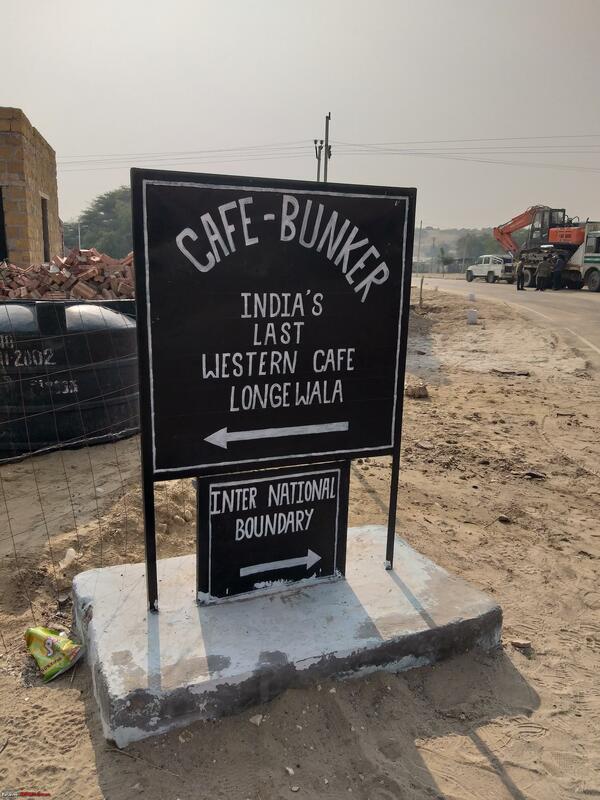 Westernmost cafe of India. Unfortunately, we didn't eat anything here because items were mostly out of stock. 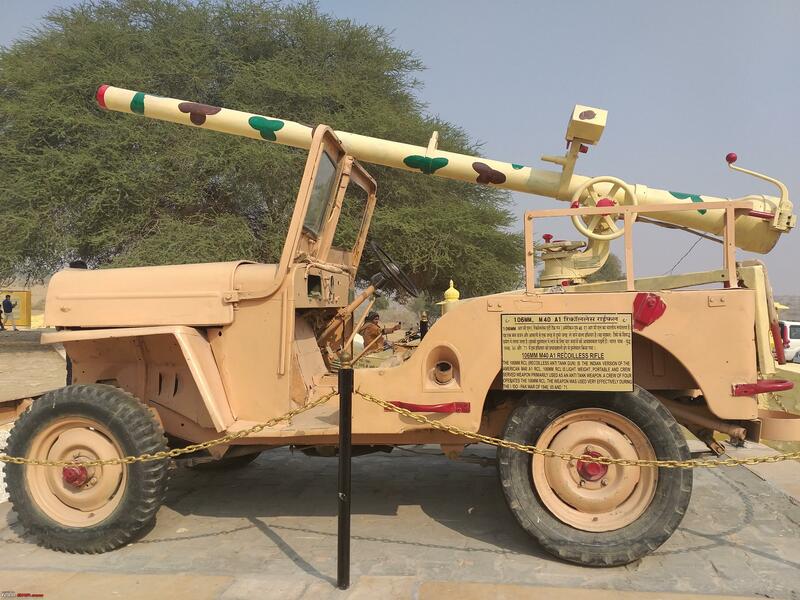 The Indian recoil-less rifle Jeep. 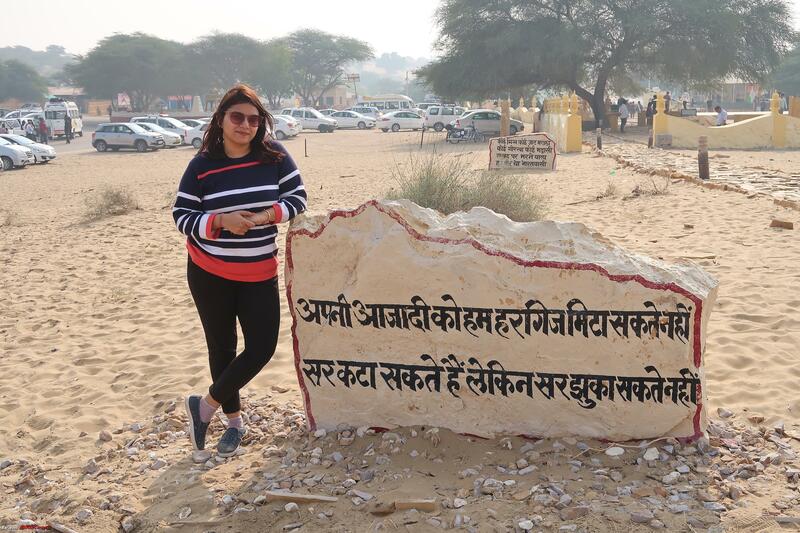 After spending some good time at the place, we left for Tanot Mata Mandir which is another 50-60 kms from there. 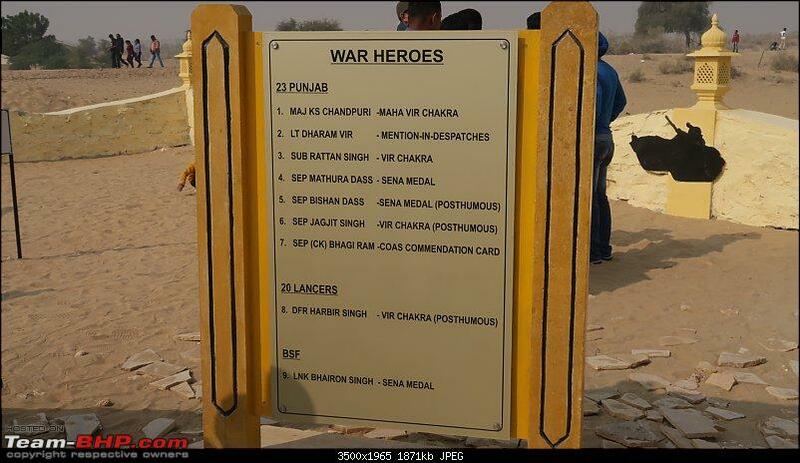 Mandir is managed by BSF. We worshipped Tanot Mata and talked about the story associated with the temple (which you can read online). At the template gate, there was an unusual buzz going around under a small shade. 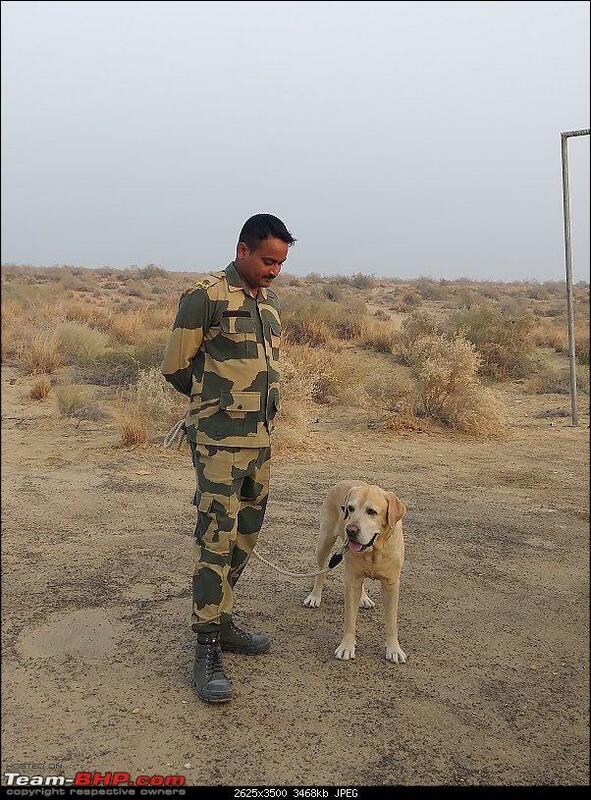 Inquiring there we found that it was regarding permission to visit India Pakistan border. 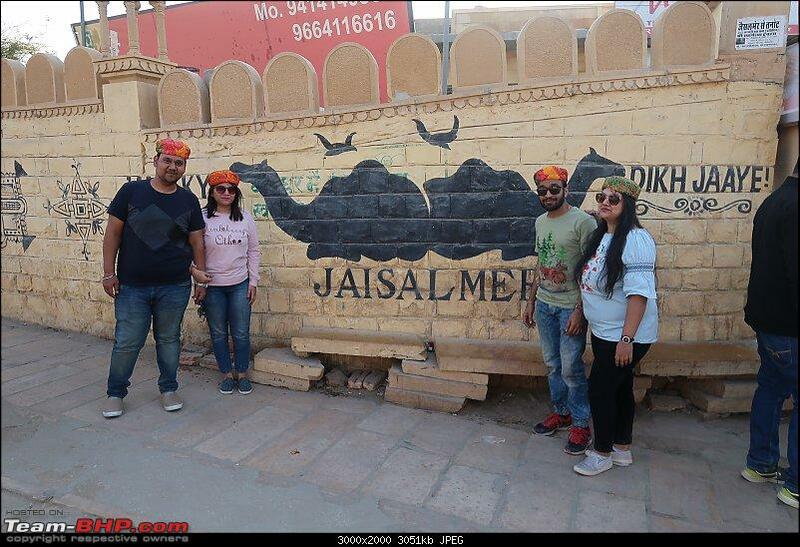 Sadly, we came to know that we required to have permission from Jaisalmer headquarters. I had given up but my brother-in-law stood there helplessly trying to think of a way to get the permission. Looking at his dejected face, a soldier came and asked us if we wanted to go. He nodded immediately. The soldier took his ID card and gave us permission to go. I couldn’t believe and ran immediately to the car and came back racing it. Apparently, the border entry closes at around 4.15 PM and it was 4.05 PM and they were allowing the last batch of visitors. We just made it in time. 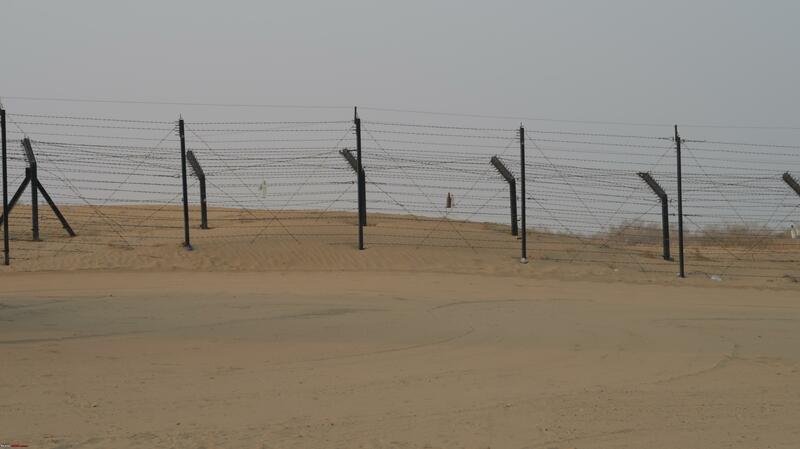 The border is another 10-15 kms from there. 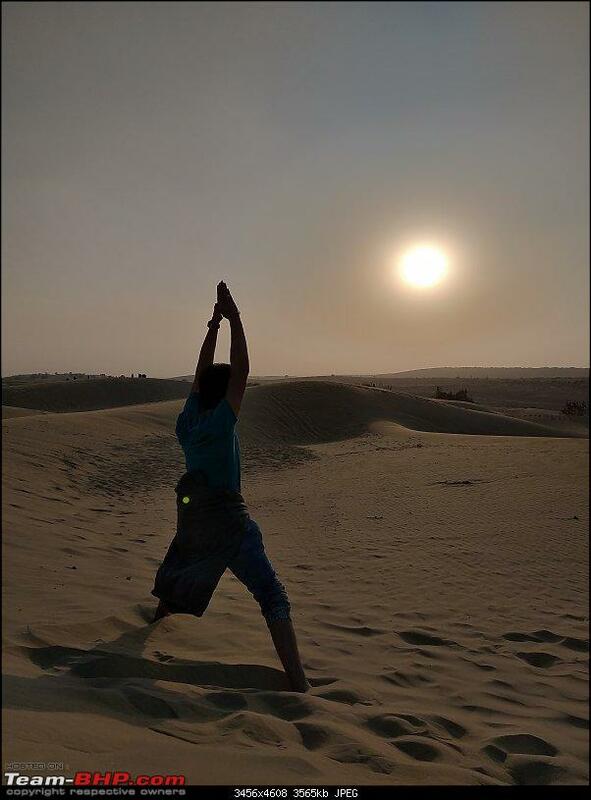 If you visit Jaisalmer, it is a place not to miss. Get permission before you visit here as you might not be as lucky as we were. 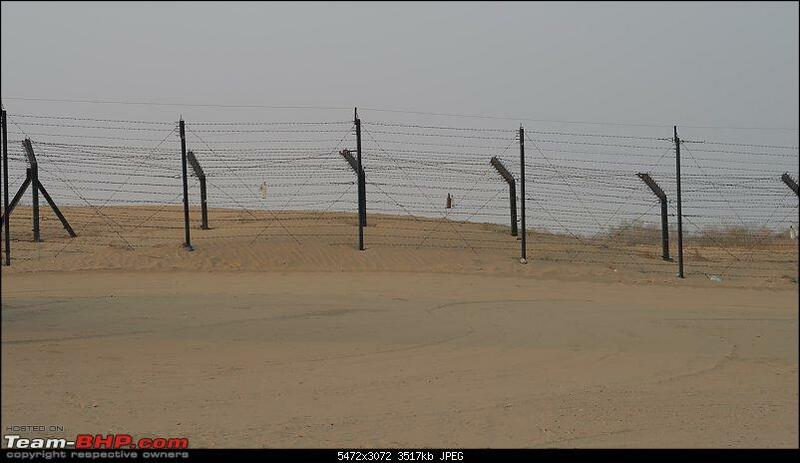 We could see the border-fence in front of us and Pakistan on the other side. There were a couple of soldiers there who were very friendly. They were patiently answering people’s random questions. 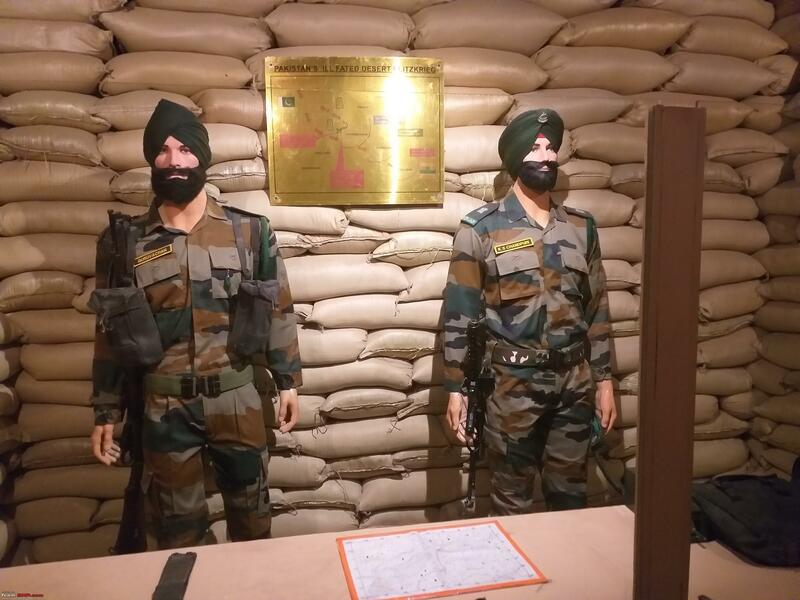 We got to know a lot about how security is managed at the border. It was an experience of a lifetime! We returned at around 6 PM. The sun had set. We were at the Mandir again where we stopped to attend nature's call. We were going to leave straightaway after that when my wife said that evening Aarti in the mandir was really great and should be watched. We, being not that into praying, we're not much interested. But, she insisted so we had to go (married members would understand). Surprisingly, I was glad we did. The Aarti was the best one we had ever seen in a temple. 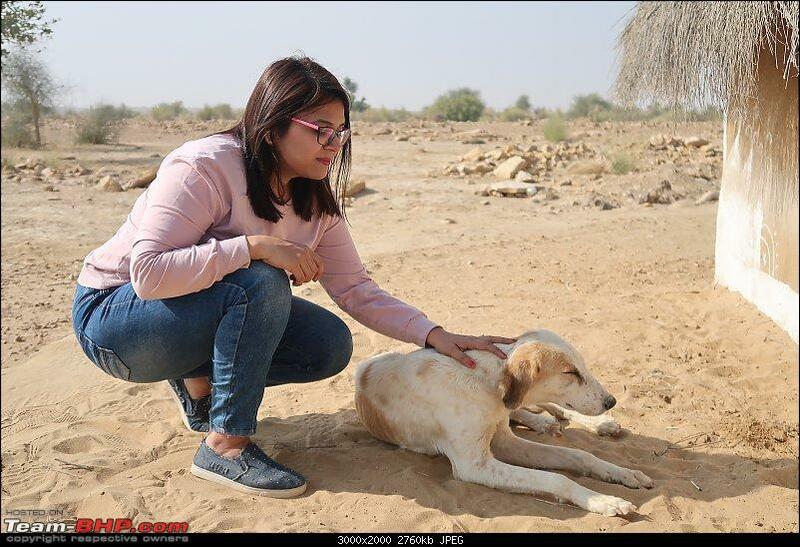 The BSF Jawaans pray to her with so much energy! We sat there for a good half an hour before leaving. If you visit here, do not miss the Aarti. It starts at around 6:30 PM. 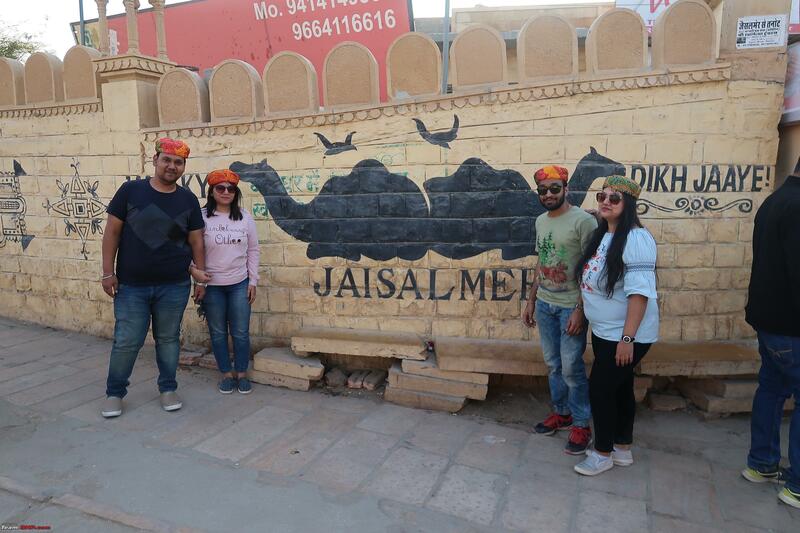 We returned to Jaisalmer by 9 PM and had some authentic Rajasthani food at Thakur Ji Restaurant. Being a Rajasthani, I can say that the food was amazing. We had daal bati, gatte ki sabji and bajre ki roti. My mouth is watering as I write this. We returned to our hotel and were in bed by 12 AM (I think). Last edited by Samurai : 14th January 2019 at 09:27. 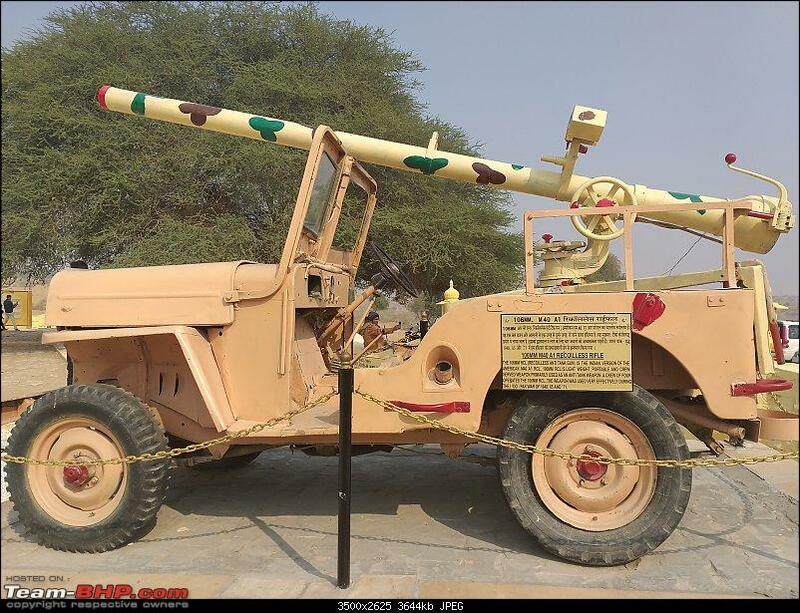 Reason: Not Pak RCL Jeep, it is Indian. Sun rose too soon the next day and we wanted to sleep more. But, we had to check out, so needed to pack everything. Our plan was to visit Jaisalmer Fort in the morning and then get to our next stay. However, we were utterly disappointed by the over-crowded fort. So much so that, we came back within an hour of entering it. It wasn’t worth wasting our time in that crowd. Next, we were going to a small village called Mala ki Dhani to spend the next day. Initially, our plan was to stay in a tent house. To our disappointment, they were insanely expensive. Hunting for cheaper alternatives we came across this place on AirBnB. It had a lot of positive reviews from all around the world. Place looked authentic. 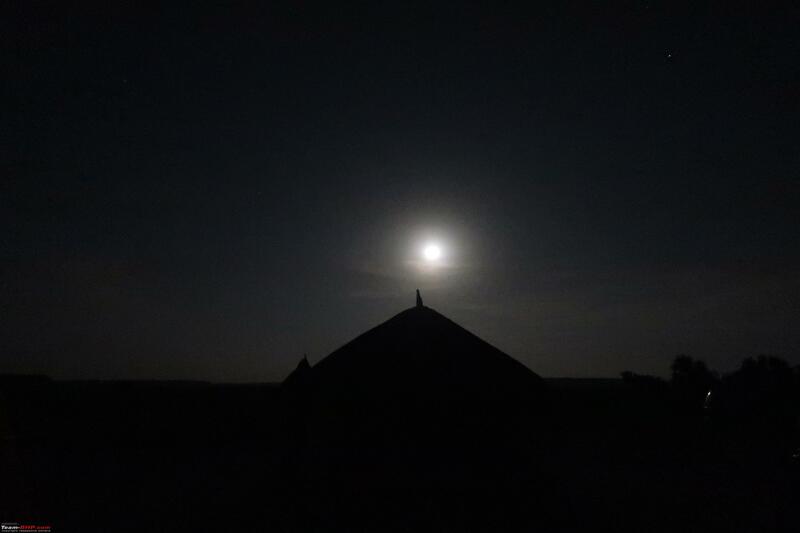 The idea of spending a peaceful night in a village without electricity sounded fun. So, we decided to give it a try. By the way, it cost only Rs 790 for one night for 4 people! Yeah, read that again. 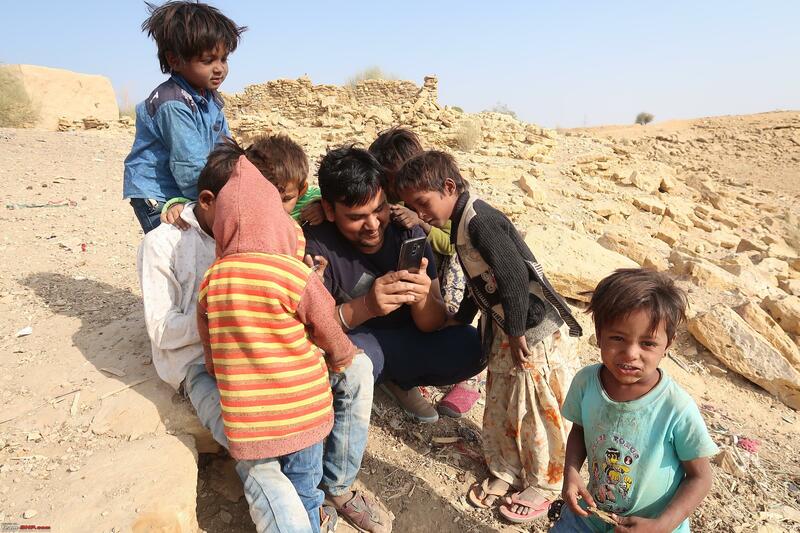 Our host Om, came to Jaisalmer to pick us up. 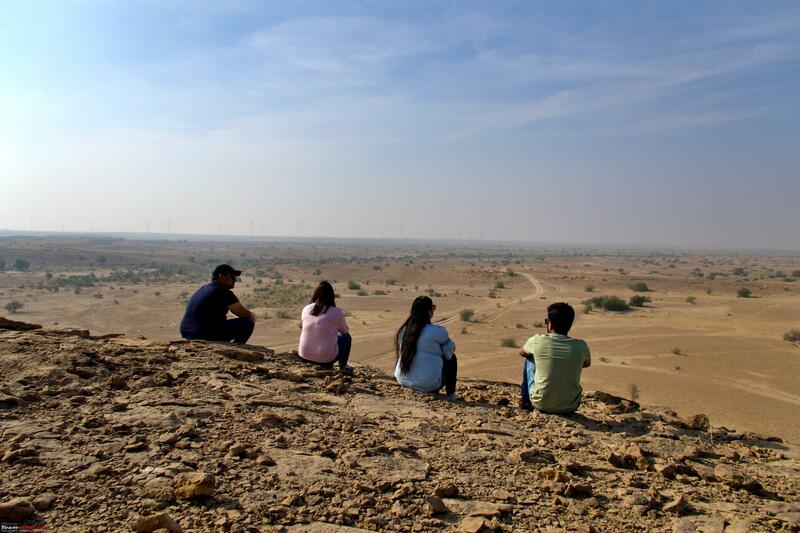 The place was around 20 kms from Jaisalmer and in a kind of off-road area. We reached there around 1.30 PM. We were assigned a small hut with 4 “charpais”. 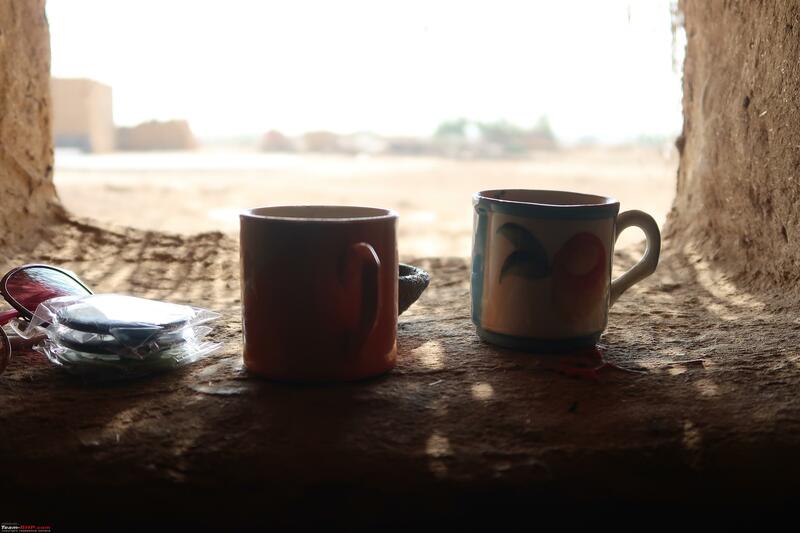 We were given a hot cup of home-made tea and asked to get relaxed. We originally had plans to visit sam-sand dunes the same day, which would be organised by Om. But we were late to inform him. 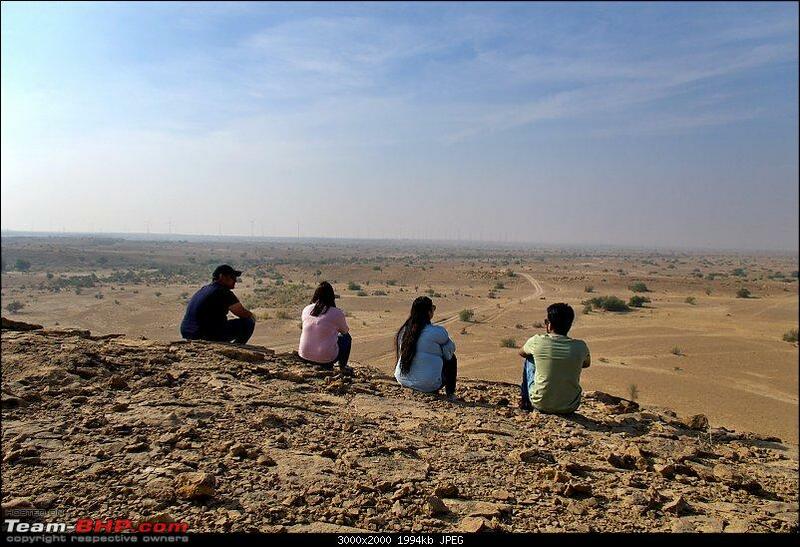 We were looking for options to stay one more day anyway, because we had not visited quite a few places in Jaisalmer. So, we decided to postpone the visit to sand-dunes and enjoy our stay in that paradise. The rawness of the place got my inner child excited. I could see a small hill about a kilometre from the village. I wanted to climb it and enjoy the view. It also had a small temple atop it. The lunch was under preparation so we decided to do it before eating anything. Although the hill was small, it was a fun trek. However, the jaw-dropping view from top of it was the real deal. 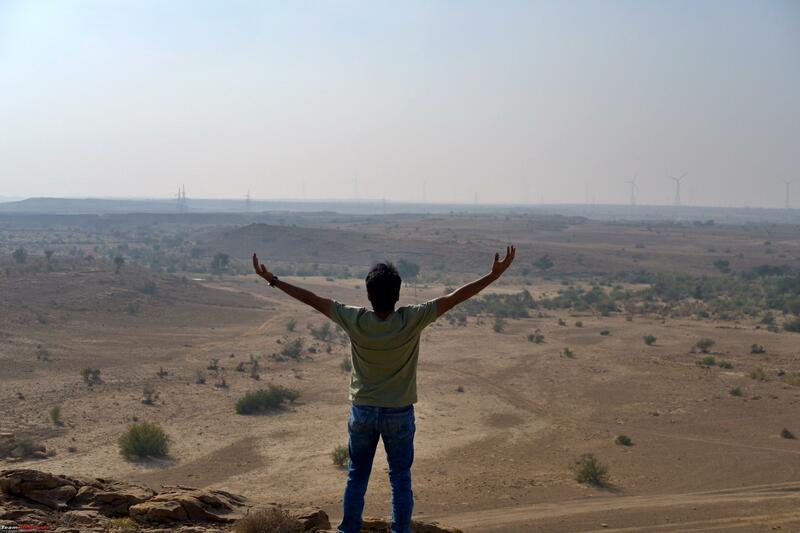 Miles and miles of barren land with cool wind blowing - I could not appreciate the view enough. There are not many places in India where you can get such a beautiful look of our country. The photography session started. My mischievous mind thought of a wild idea. We decided to do a treasure hunt with our vlog. The deal was - we would hide a small amount (Rs 100 note) in a sealed plastic bag and hide it somewhere on top of that hill. We will tell where exactly we hid it. Anyone who has seen our vlog could come and there and find it and share it with us. That way the hunt would be complete. We did exactly that. 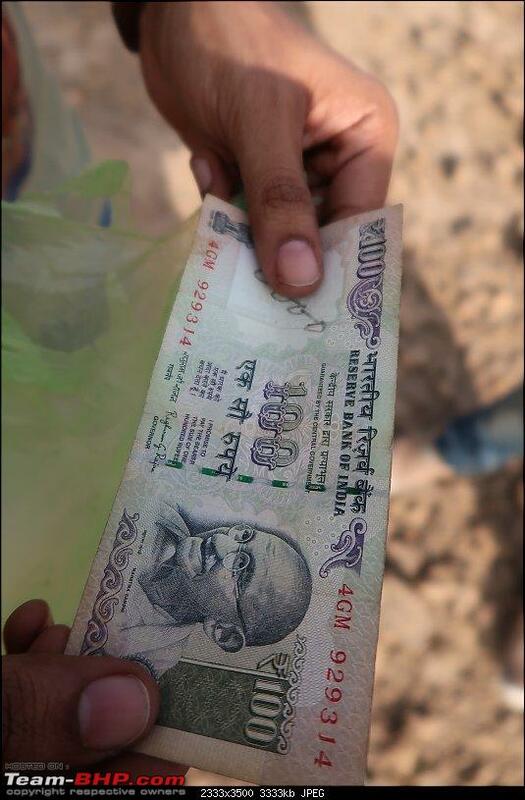 Hid a Rs 100 note behind the temple about 17 feet away under a stone. We dug deep to ensure nature did not erode it away. We also took a photo of the note to ensure the serial number matched. And, if no one found it, we would visit and find it ourselves. Isn’t it exciting? 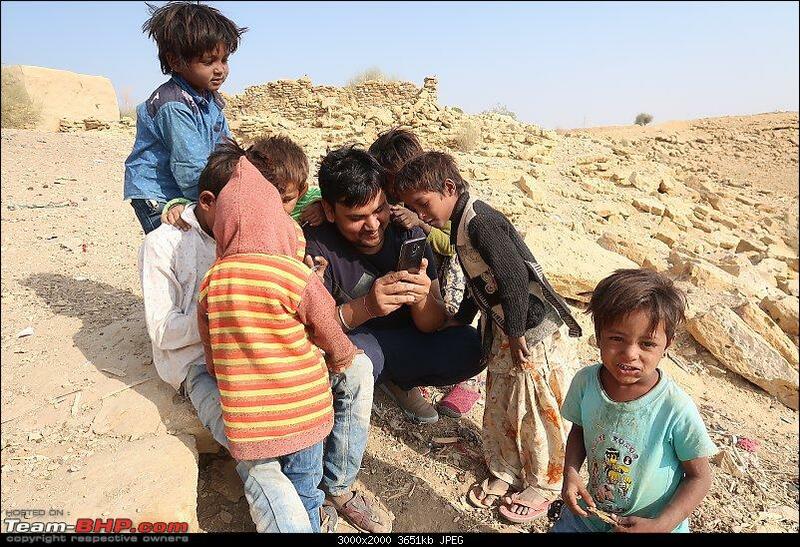 Please watch our vlog to find the treasure and find it if you ever visit Jaisalmer. We returned at around 4 PM and had our lunch. There was still some time left before sunset, so we decided to visit Gadsisar Lake and Bada Bagh. The lake was not worth it - just a lake full of crowd. 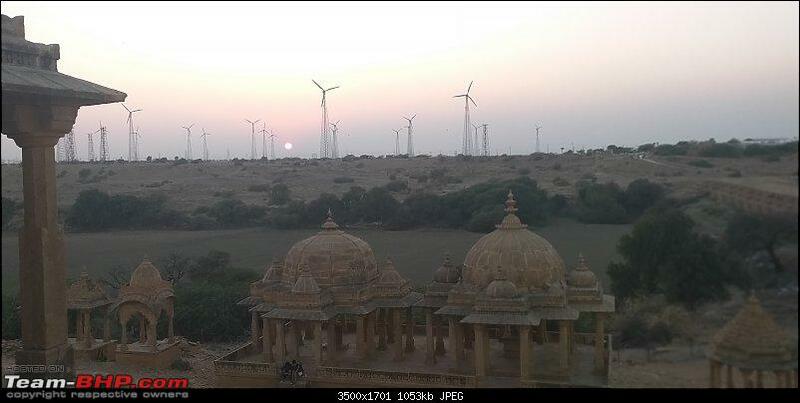 However, Bada-Bagh was indeed worth it because of the view we got for the sunset. They charge Rs 100 per person as an entry fee, but I think it was worth it. 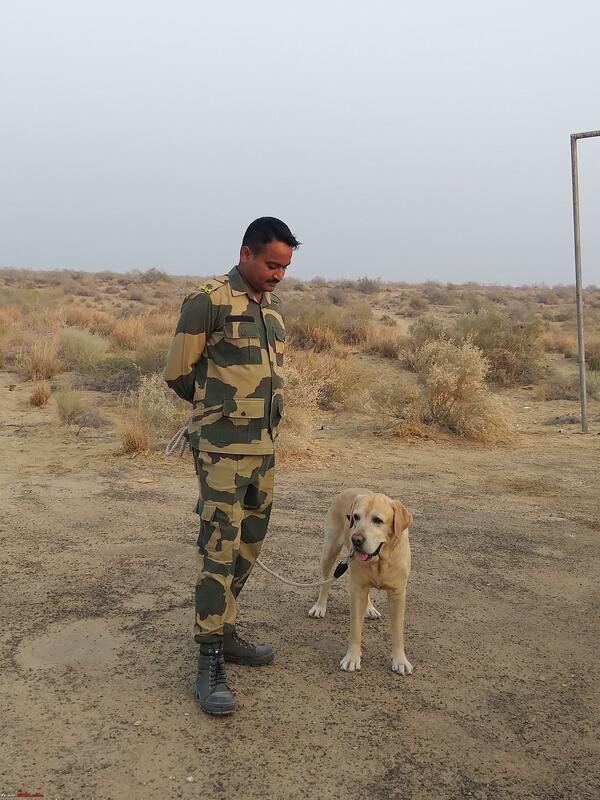 Plus, BSF uses the money to manage the roads around the place. After the sunset, we returned to our village. 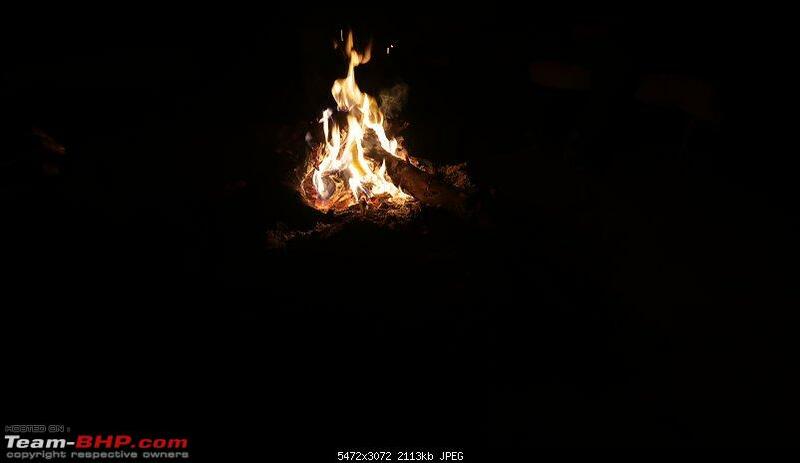 A campfire was waiting for us. It had gotten really cold. Desert weather is extreme - the during the day we were roaming like it was summer and by night it was as if we were in the Himalayas. The campfire setup was perfect. 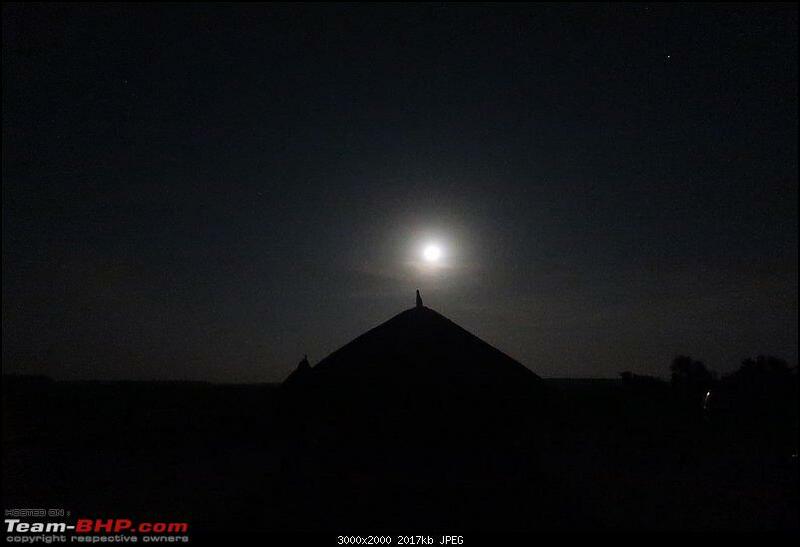 Four charpies were set up around it and people from other huts were also sitting there. We were chatting and warming our hands. Out of nowhere, someone said, “Yaar ise to mein janta hu” I looked around and found my office college Sankalp there. The level of the coincidence! 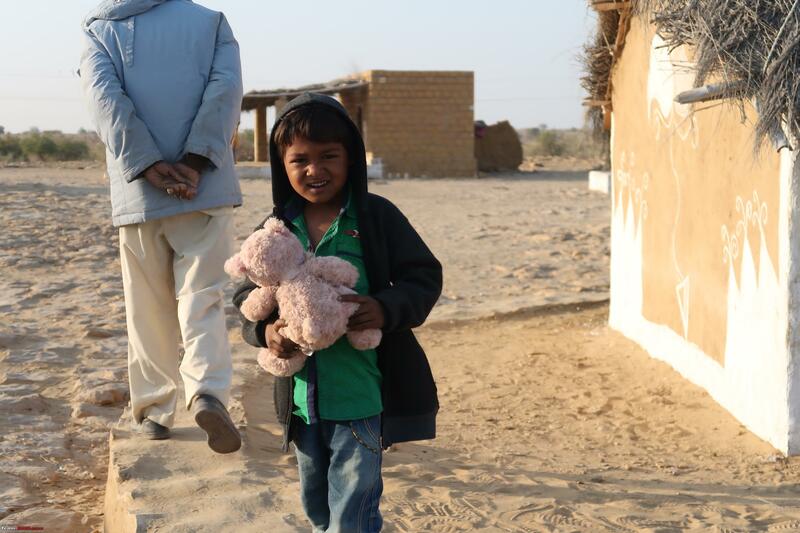 Of all the places in entire India, we ended up booking same remote village on the same night! Our office has just 20 employees, by the way. Anyway, we talked about how peaceful this place was, where were the heading next, where did they visit today, and other stuff. Sankalp plays the guitar. So, soon he joined us with his guitar and made us all sing on songs like Iktara, Roobaroo, etc. The night couldn’t get any better. We had our dinner by the campfire itself and then went to bed. Last edited by shashankjain16 : 13th January 2019 at 19:56. 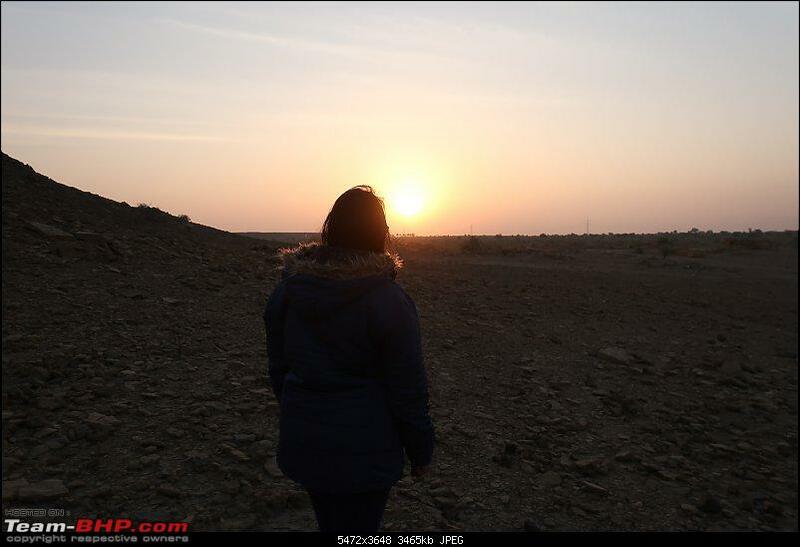 We had decided that we would get up early the next morning and climb the hill again to watch the sunrise. It was freakin’ cold and very difficult to get out of bed. We were shivering like hell. Still, we got up and managed to climb the hill. I set up my camera for time lapse and waited for the sunrise. That sunrise was worth every shiver we had! The sky was clear and the view was perfect. No words can do justice to the soothing feeling of such a perfect sunrise. You have to be there to appreciate it. We returned soon after sunrise. Later in the morning, we went to the nearby village to talk to local people. They were so welcoming and happy to see guests in their home. We played cricket and talked about BJP vs Congress (lol). We left for Sam sand dunes around 2 PM. On our way, we finally got to see sand dunes! The road was, again, amazing. 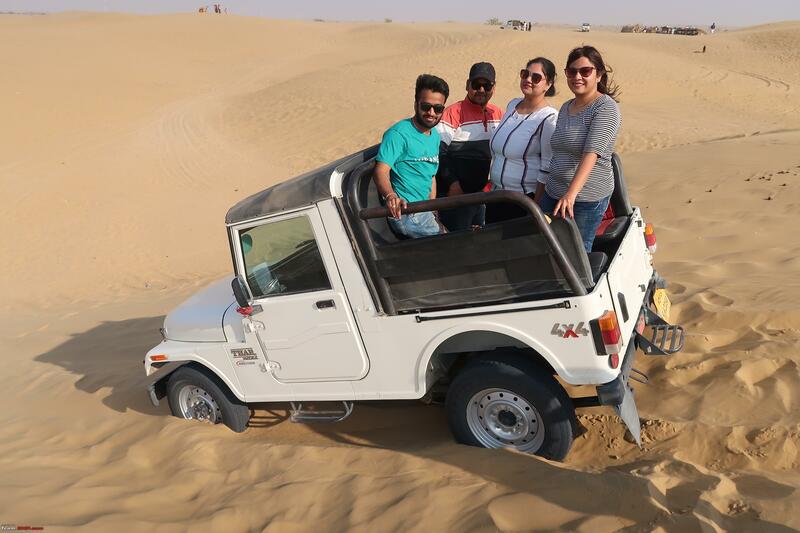 ride to dunes was full of stomach-churning bumps on the back of the camel. We played a lot in the sand dunes and did random stuff. 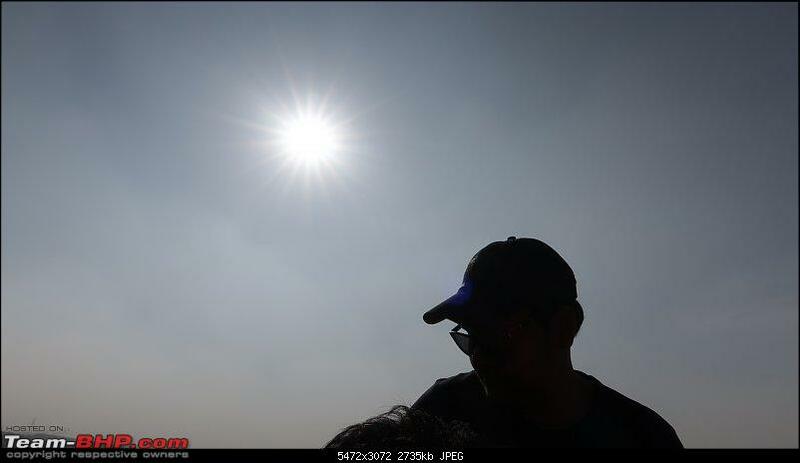 Lots of photos were clicked. We returned after sunset. Back in the resort, setup had been made for dinner and Rajasthani traditional performance had started. The food was amazing - authentic Rajasthan I can say. After dinner, we returned to Mala ki Dhani. Sitting beside campfire for some time, we went to bed with a little heavy heart that we would be leaving in the morning. Overall, the trip turned out to be more fun than I had expected. 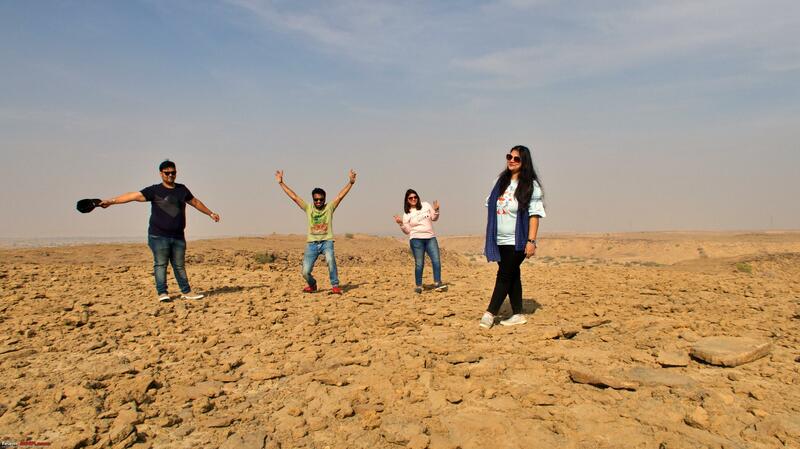 I would cherish its memories forever and will visit Jaisalmer AGAIN for sure!! Thanks for bearing with me till the end. Hope it wasn’t boring. Last edited by shashankjain16 : 13th January 2019 at 20:06. @shashankjain16 great post! thanks for sharing! Life is meant for good friends and great adventures!!! Great travelogue and amazing pictures. 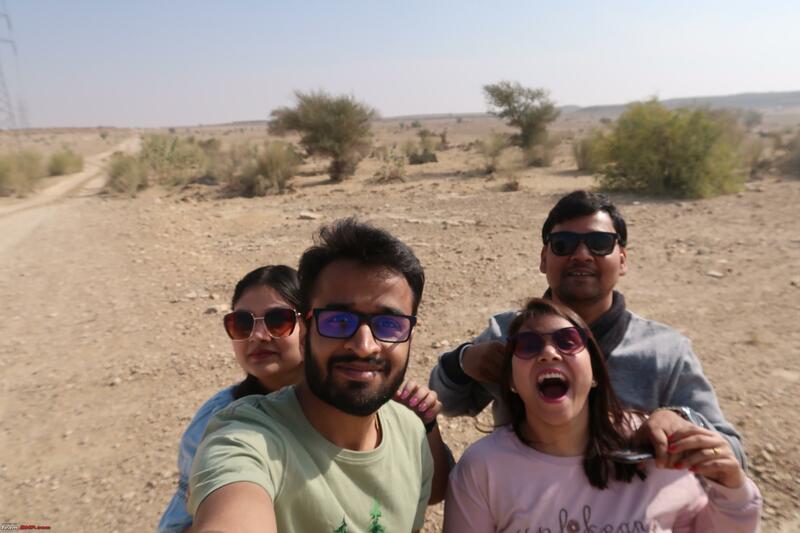 Your trip reminded me of my own Jaisalmer trip in Dec 2016. 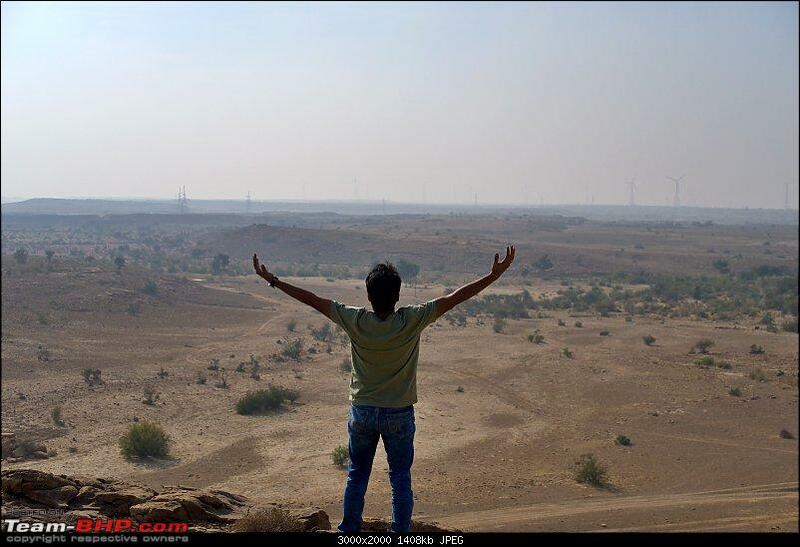 I had taken Jaisalmer -> Ramgarh -> Tanot Mata Mandir -> Longewala -> Ramgarh -> Jaisalmer route. 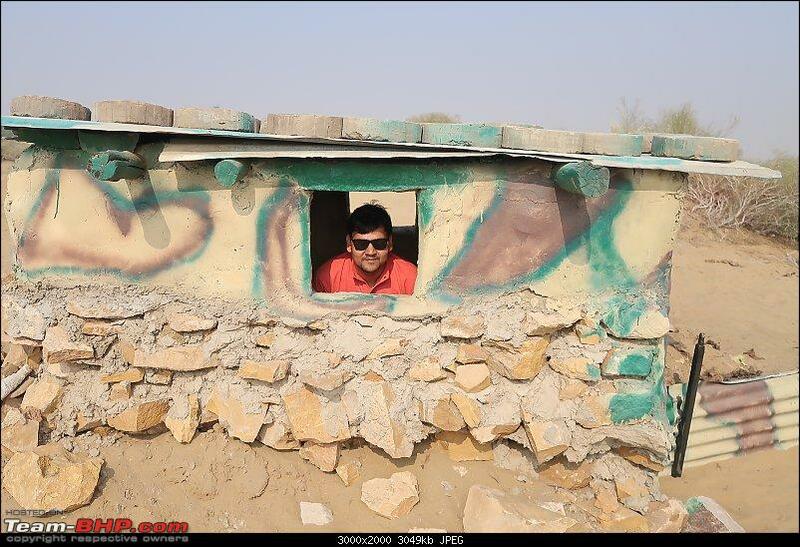 I can see that there are lot of vehicles parked in Longewala, when I had been there, there was only one vehicle parked apart from us and where is your courtsey picture of BP 638? Did you enjoy mouth watering mirchi vadas at Ramgarh? Ramgarh was in our route but we didn't try the mirchi wadas there - didn't know about them. will surely try next time! 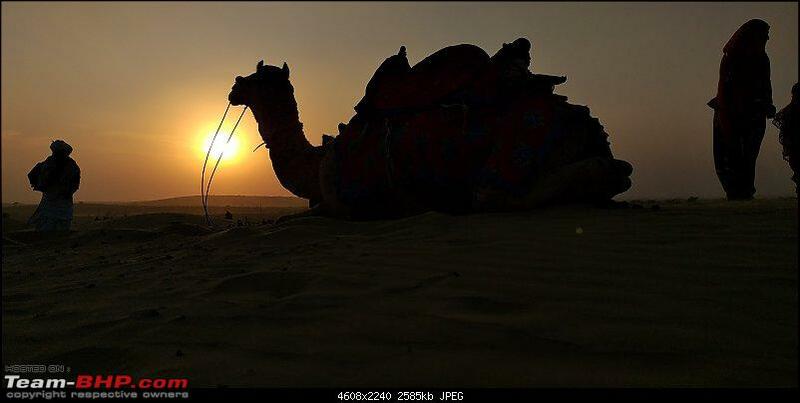 I went around Rajasthan barely a month ago, already feels nostalgic, thanks for sharing your experience & a great travelogue. 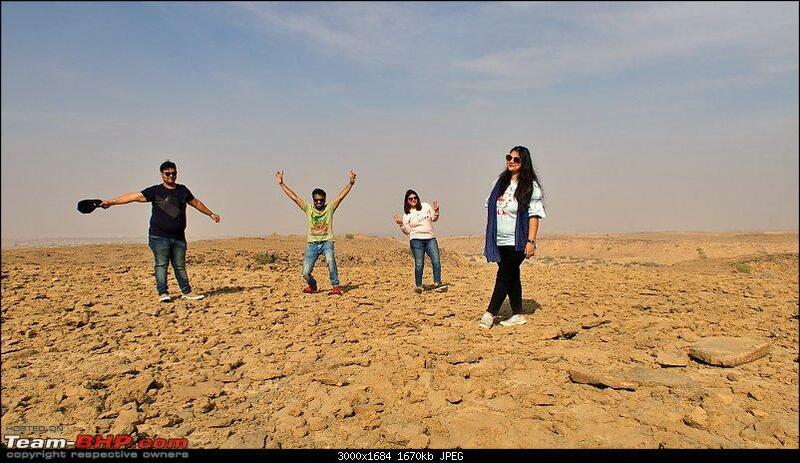 The desert drive was a great experience, I was amazed how people manage to survive the extreme conditions. I am glad you enjoyed the Jeep Safari. One of the locals took me on a fast ride on his camel. He made the camel run & I was literally hanging on for dear life, but I thoroughly enjoyed had a wide smile throughout. 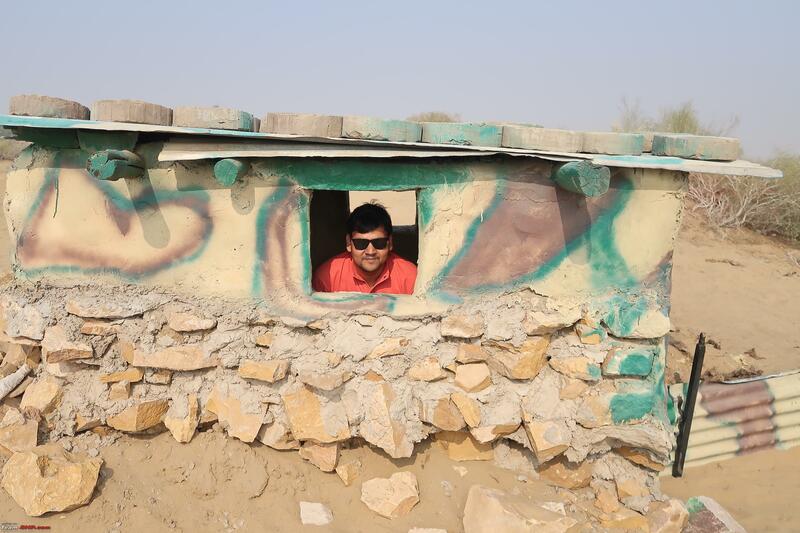 I did visit the Indo-Pak border, but I had submitted my request at the Jaisalmer BSF headquarters. However, I did it in the morning & was scheduled to go there in the afternoon. I was told the request needs to be submitted a day in advance as it has to be approved by the IG. When I reached the place, my name was not yet updated, but a senior officer saw me doing the rounds to check, he came over & asked my id card & asked another officer to approve my visit, they were really helpful. Beautiful travelogue. Liked the Rs100 Vlog challenge, do let us know if anyone finds the currency note. 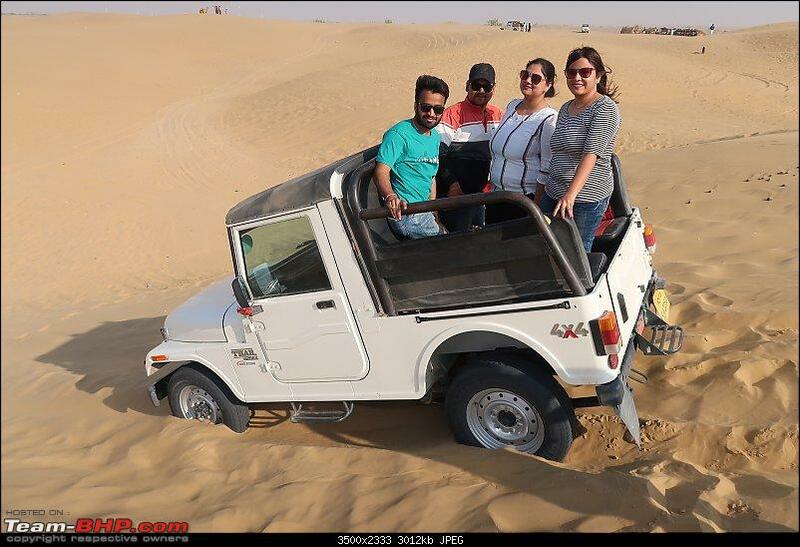 I had traveled to Jaisalmer in Dec 2001, that time Sam sand dunes was already a tourist hub, however Longewala was not much of a tourist spot. Hope to drive down there sometime (previous trip was in a rented Tata Sumo). Regarding the western most cafe, I guess it is just a marketing tactic. Western most point of India is further down at Narayana Sarovar (GJ), there are few shops there too. 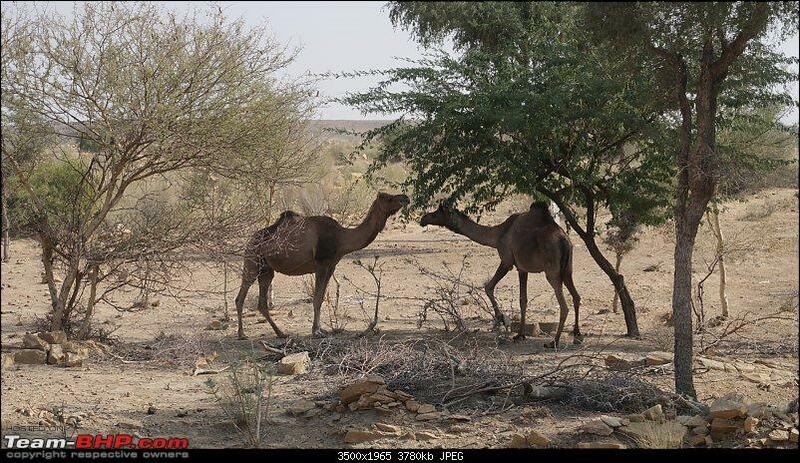 We had also done camel run. Although, it was not that fast. I know camels can run insanely fast. Still, it was a lot of fun. 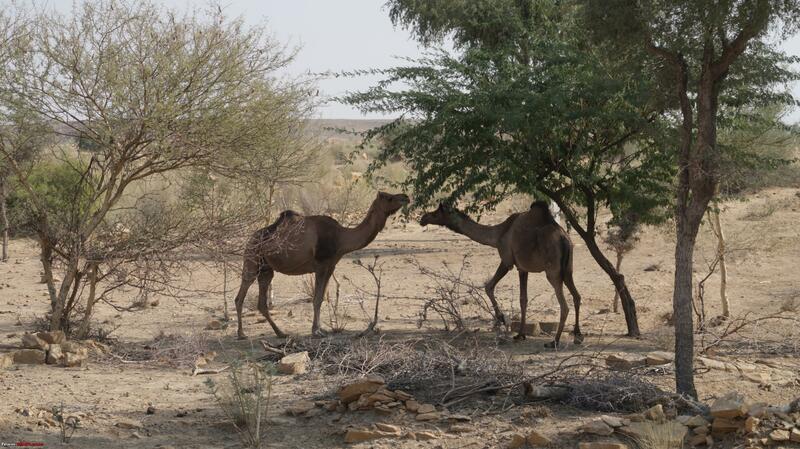 Camel I rode was named Hrithik. It was a wild idea, but now we plan to keep it a regular thing in our vlogs. 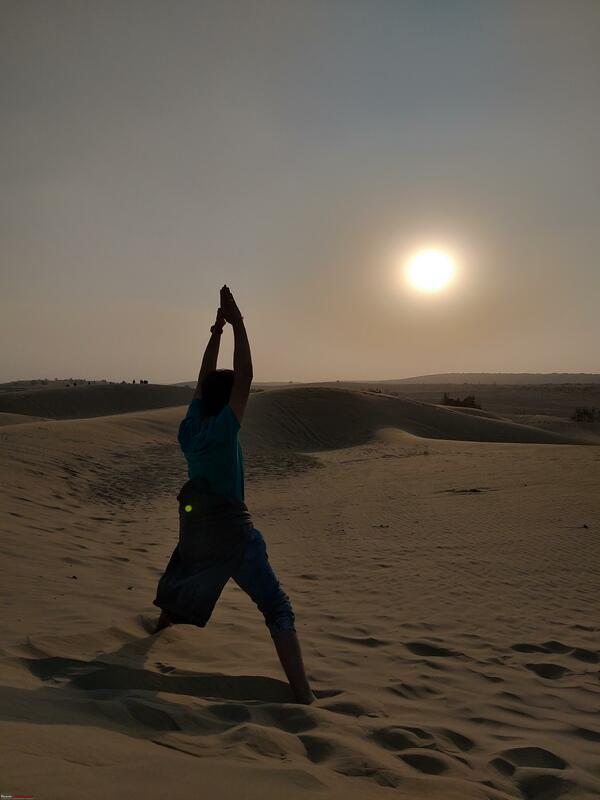 Good thing about Jaisalmer is that it doesn't rain that much so chances of it getting eroded are less. It would be difficult to find such places in other parts of India. Will surely post here if anyone finds that note. Last edited by suhaas307 : 29th January 2019 at 14:38. Reason: Merging back-to-back posts. Please use the QUOTE+ functions to address your reply to multiple members. Nicely written. The treasure hunt idea was unique indeed. 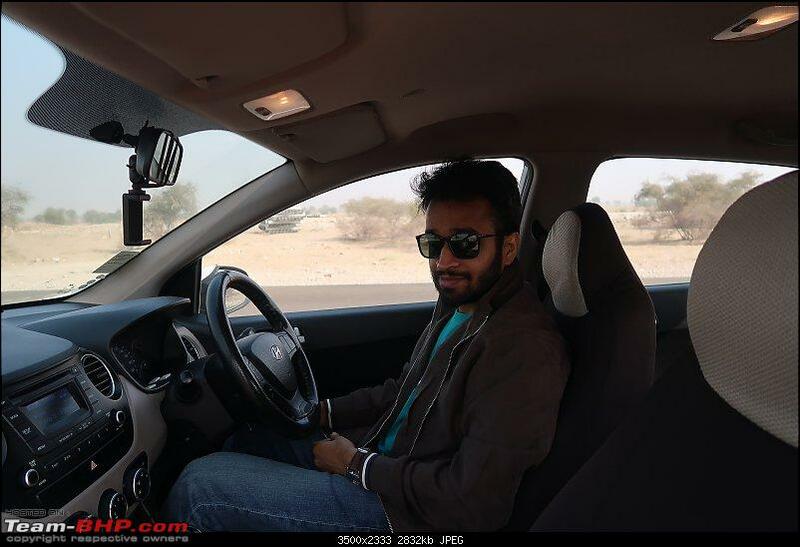 Did you happen to encounter a herd of Tata Hexa cars during your trip to Jaisalmer? I was part of the annual Hexa owners meet-up which we had planned from 24-27th December. We were about 40 of us.